The Sands Thinking Green: WHY ARE PONDS IMPORTANT IN ORGANIC FARMING? One of the most commonly asked questions is: why do we have a water pond on The Sands' organic farm? It's a good question and the answer can be very useful for anyone looking to go green or grow green. Well, for one, the pond looks beautiful and it adds a little variety to how your farm looks. This, however, is not the reason they are so useful. Dragonflies helps to remove pests from farms and gardens but it needs fresh water to breed. 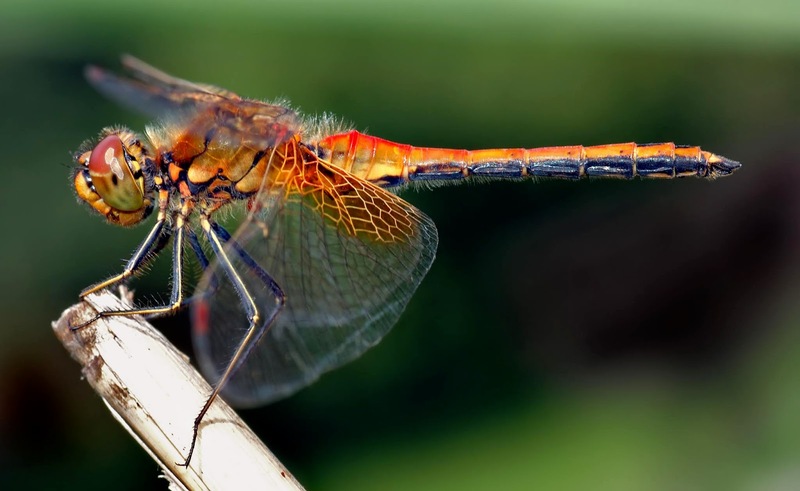 Ponds attract dragonflies, which are a superb air predator that catches and eats flying insects. Many of these insects may be pests that end up eating your veggies or laying their eggs on leaves so that their larvae can borrow into your veggies. Dragonflies rely on fresh water bodies like ponds so that they can lay their eggs. Dragonfly larvae live in the water until they are ready to climb a reed or a wall and metamorphosise (change their physical body make up) into a Dragonfly. Once it can fly, the Dragonfly uses its huge compound eyes and 'helicopter' wings to identify and grab flying insects out of the air. Ponds also attract frogs and toads which eat caterpillars, slugs, snails and milipieds, all of which can damage crops. The frogs and toads mate creating tadpoles which then turn into more frogs and toads making a small army of terrestrial pest controllers. Ponds act as a water-trap attracting and catching flying pests entering your garden. Ponds also reflect light from the sky. In some cases, the water surface is white because the day is so bright. This is a very useful side plot for pest control. It is well known that at night many bugs fly towards electric lights; the same is true during the day when ponds reflect sunlight or at night when they reflect moonlight. It is a natural trap for flying bugs which may be on their way to eat your veggies or lay their eggs. Below are some things that are important to note for the management of your water body. Remember, if you do not have fish in your pond you will have mosquitos and your neighbours may not like you breeding mosquitos. So what is the natural mosquito larvae control method? Fish (some species of Tilapia can live in quite brackish water). With all the fish, dragonfly larvae, frogs, toads and a whole host of other organisms in your pond it will not be long before the water gets dirty and maybe even smelly. A quick fix for this is a natural filtration system.. something to remove the sediment and nutrients from the water such as water plants, reeds and lilies. (WARNING: Do not put Nile Cabbage in your pond as it will take over and kill all life). Once you have the above you will have a pond that is naturally controlling and balancing itself as well as ensuring you have some important natural pest control methods - no pesticides needed.